WIP. Stencil Tips. And a Giveaway!!! This week I am working on a few colorful projects. This stencil, from The Stencil Company, is called “Geranium“. However, if I stitch it on green fabric, I think it will pass as a shamrock for St. Patrick’s Day. It can be stitched with the cross-hatch center and your own “doodle” design in the outer border. 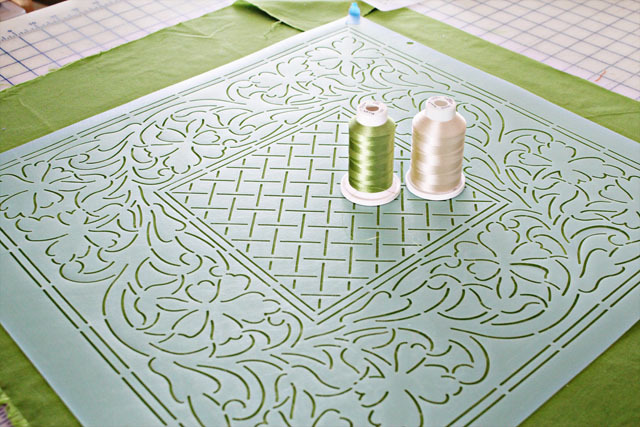 The outer leafy border can be quilted around a pieced or appliqued block. This stencil can be used to draw just the inner and outer square–leaving a blank slate for doodles–easier than using rulers. Individual leaf/flowers can be repeated in a row to make a geranium border. Finally, the cross hatch pattern can be used as the “rails” for other designs…again much easier than using a ruler. I will add a tutorial on this in an upcoming post. 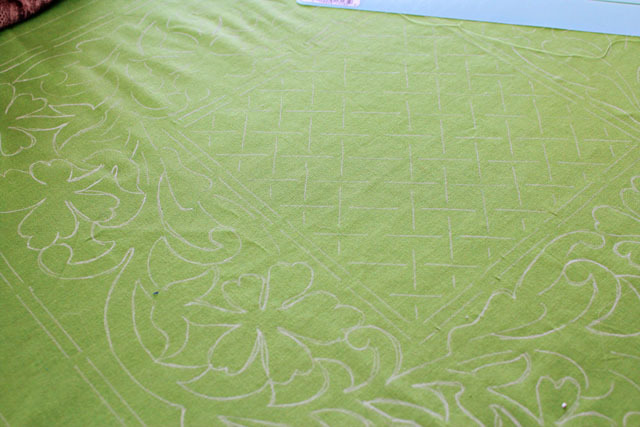 After I draw the stencil as it is cut…I trace over the lines and fill in the gaps. This makes the lines easier to follow while free motion quilting. Also, it helps plan out the stitch order and understand the design. Once I finish drawing the stencil, I will make the “quilt sandwich”. Finally, I plan to audition a few thread/needle combinations. Now for THE BEST part…sharing with YOU! The Stencil Company is going to provide two “Geranium # SCL-513″ to TWO lucky readers of The Inbox Jaunt! 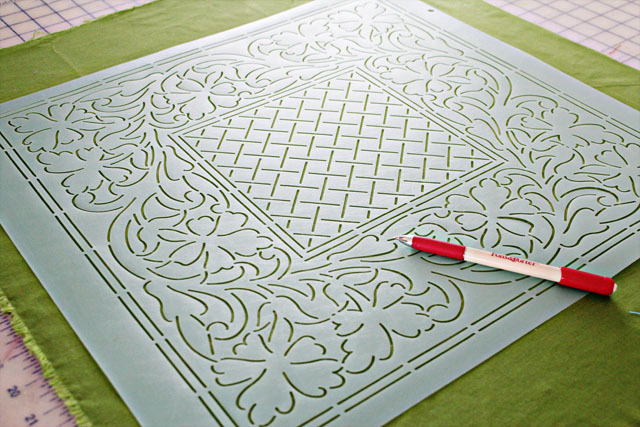 Do you know how to set your machine for free motion quilting? How many total hours have you spent free motion quilting: Less than 20 hours, Between 20 and 100 hours, more than 100 hours. 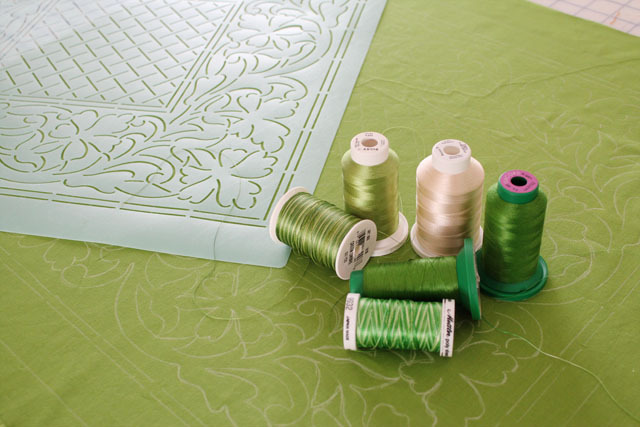 What is the hardest part of free motion quilting for you? That’s it! There are several more stencil tutorials to come, and The Stencil Company will be offering several more giveaways through The Inbox Jaunt...so check in often! You might also like this post on stencils. How cool! (Do we answer all 3 in one comment?) 1. Yes – after having to get a new needle shaft thingy installed on my Sapphire, I learned that I’m supposed to be telling its brain when I’m free-motion quilting. Works like a breeze now! 2. I’ve done right around 100 hours of FMQ. 3. I cannot, for the life of me, make decent-looking freehand feathers! Going to happen one day. What a pretty stencil. I’m working on one now that I traced onto thin paper and then stitched multiple copies (stapled together) and spray basted them to my quilt sandwich instead of trying to trace each one. It’s a queen size and the biggest thing I’ve done on my domestic machine, but I’m really happy with the outcome. So to answer your questions – Yes, I know how to set up my machine for free motion quilting; I’ve spent more than 100 hours FMQing. The hardest part is being patient enough to go slowly, but I’m working on that, LOL. i just discovered your site a few days ago. 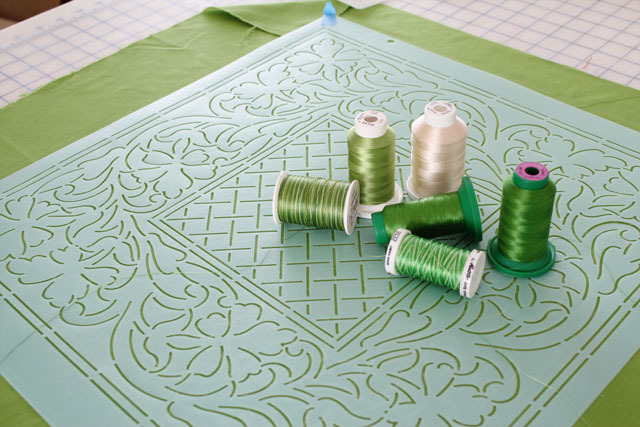 love the quilting tutorials! 1. yes, i just started fmq a couple years ago. 2. hmmm. not really sure how many hours i’ve spent. probably more towards the 100 and over. not real good at keeping track when i start. 3. the hardest part – getting out of my comfort zone and trying something new (and intimidating). Oh yes, I would love to have a chance to win that lovely stencil. 1. Yes, I know how to set up my machine. 2. Total hours- probably greater than 100. Happy Wednesday – it is sunny and warmer today (20s) here in Illinois. That’s a really pretty stencil! My answers: 1) Yes, I know how to set up my machine. 2) Less than 20 in free-motion. I usually do straight line on the machine. 3) Controlling the stitch length and making my curves smooth are the hardest parts. I know – I should practice! Wonderful stencil — that company has great designs! 1. Yes, most definitely and on all my machines!! 2. Way over 100 hours of free motion quilting. Stopping by from WIP Wednesdays, I’m not sure if this giveaway is open to international entries, but worth the try, its a great giveaway!!! 1. YES, I set my stitch length to zero, and replace my walking foot with my FMQ foot (darning foot) and I must for me is to use embroidery needles. 2. I’m certain that I’m very CLOSE to a 100 hours. 3. The hardest part for me when FMQ is to decide on the FMQ designs, and also… know when to stop! I sometimes also have a hard time to keep my scale right…I’m totally addicted. Love the chance to win a stencil, thanks! 1.yes. 2. 20-100 hours 3. My challenge is maintaining flow and rhythm in my free motion stitching after i force myself to take a rest break! I have learned that my body will suffer if I follow a creative urge to sew until the project is complete, 6 to 8 hours later. It’s frustrating to stop stitching when I’m really enjoying myself! 1.) Yes, I know how to set my machine up and use it often for free-motion quilting. 2.) Probably between 20-100 hours. 3.) The hard part: Being consistent when doodling, and cleanly backtracking when necessary. But then, only practice makes perfect! 1. Yes, I know how to set your machine for free motion quilting. 2. I’ve probably spent more than 100 total hours doing fmq. 3. The hardest part for me is getting started. I know I still have a ways to go to be able to confidently quilt all the designs in my head. Actually, I wanted to comment on that lovely shade of pink thread. It’s so pretty, like ballet pink. Gets me kind of inspired. I don’t know how to set my machine to free motion. Love the stencil and the directions on how to use it. I bought some stencils at a quilt show recently and now I’m inspired to try them. 1. Yes, I know how to set the machine. 3. It’s the learning curve of being comfortable with letting it flow instead of ride along the 1/4″ line. Less than 20 hours currently. 🙁 Life, you know. The hardest part is trying to figure out why my thread keeps breaking. 🙁 Perhaps operator error? 1. Yes, but it’s still tricky. 2. in 12 years–over 100 hours. 3. The hardest part is figuring out which design to use to fill the space. Yes,I know how to set my machine for free motion quilting. I have free motioned quilted between 20 & 100 hours. The hardest part is deciding on a design and then getting over the fear of ruining my quilt top and starting. Once I start, I will keep going. 1. yes I know how to free motion quilt. 3 even stitiches, I do not have a stitch regulator on my domestic home machine. I use a frame and making sure the stitches are all even is difficult. Practice makes perfect. Yep, I know how to free motion quilt. Trusting my judgement. It’s hard to just doodle, I find I need to practice the muscle memory before putting it all together. What a wonderful blog. I know I’ll be back !! 1) Yes, I know how to set my machine up . 2.) Probably more than 100 hours. 3.) The hard part: Being consistent when stippling. Just found your blog via Pinterest and I am going back thru all of your posts – so many lovely creations and photos. 3) most difficult is being fluid/smooth/consistent, especially on a large piece. WHICH machine do you FMQ on? I see that you have 3 Berninas, are any of them being used on a frame or are you manipulating fabric rather than machine? So glad you found us and so glad we had this opportunity to cross paths! I use the Bernina 150 Quilter’s Edition and Bernina 820 for free motion quilting. The “150” is a standard sewing machine size and it sews very well. I purchased the 820 –which has a larger “harp space” so that I could work on much larger spaces more easily. Unfortunately, that machine has required a lot of repairs/tweaking and is now in Chicago at the Bernina USA repair shop… So to answer your question, at this time, all of my stitching is done by manipulating the fabric roll in a standard machine or my Bernina with extra harp space. I agree that it is difficult to be fluid on a large piece. Choosing the quilt design is trickier–I generally choose motifs that are fairly small…and I quilt heavily! I will be doing more posts on that as it is a problem for everyone–and perhaps we can all brainstorm! I know how to set up my machine but sometimes I still stuggle with getting the proper tension. As for machine quilting, I’m still new & have spent 20 or so hrs. I stuggle with quilting large quilts on my domestic machine and not being so critical. That is a beautiful stencil!! Now on to your questions. 1. yes I do know how to set my machine up for FMQ. 3. the hardest part of FM for me, is wrestling with the quilt, since most of my quilts tend to be king size or larger.